The Nazis set out on the road to war in the mid-1930s, as Hitler and his government adopted domestic and foreign policies which contributed to the outbreak of World War II. Many involved flagrant violations of the Treaty of Versailles (1919), as well as other international agreements. Yet while European governments were well aware of these breaches, they took no strong action against Germany. Most leaders adopted a soft line on the Hitler regime, ignoring or rationalising his actions. They preferred to make concessions to Germany rather than risking another devastating war. This approach has become known as appeasement. With hindsight, the appeasement of Nazi Germany was an error of judgement. It encouraged Hitler, who was already hell-bent on war and conquest, to further intimidate and menace Germany’s neighbours. Rearmament. Hitler’s economic policy through the mid-1930s centred on the re-arming and expansion of the German military. This program began in secret but it was widely known around Europe by 1935, the year Hitler reintroduced conscription and approved the first of several large military parades. The following year Hitler unveiled his Four-Year Plan: ostensibly an economic program to achieve German self-sufficiency; in reality a schedule to prepare the nation’s military for war. By the start of 1939, Germany’s armed forces boasted more than 900,000 soldiers, 8,000 aircraft and 95 warships. The Rhineland. The region surrounding the Rhine River was essentially a buffer zone between Germany and her western neighbours: France, Belgium, Luxembourg and Holland. The Versailles treaty prohibited Germany from stationing any military forces in this area. 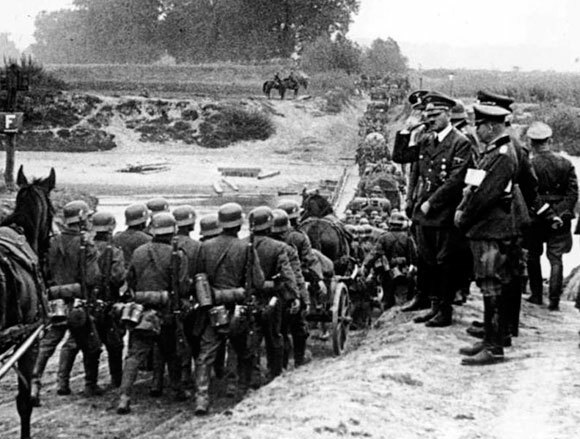 In March 1936 Hitler ordered German troops back into the Rhineland, in defiance of the treaty. The remilitarisation of the Rhineland was hardly a dramatic incident (most Wehrmacht soldiers rode into the region on tractors and horseback; they had been ordered to retreat if the French retaliated). The move could have instigated a war with France, whose forces were then numerically superior to Hitler’s. But the Fuhrer had chosen his moment: France was in the middle of an election and distracted by domestic issues. Neither London or Brussels opposed the re-militarisation, though Winston Churchill – then a backbencher in the House of Commons – proposed military action to remove the German troops. The Hossbach memorandum. In November 1937 Hitler summoned his foreign policy advisors and military commanders to a secret meeting in Berlin. There he laid out his concerns about Germany’s economic growth, stressing the need for autarky (self-sufficiency in food and raw materials) but also acknowledging it was going to be unachievable. Hitler instead proposed a military solution: expansion into eastern Europe so Germany could access land and raw materials there. Much of the meeting focused on how European powers would respond to this. Hitler’s advisors agreed that aggression against nations like Czechoslovakia would probably provoke war with Britain and France – but they urged Hitler to wait, suggesting Germany would not be prepared for a major war until 1941 or 1942. Discussions at this meeting were recorded in a memorandum prepared by Colonel Friedrich Hossbach. This document was one of the most compelling pieces of evidence of Hitler’s war plans. Anschluss. The term anschluss is German for ‘connection’. In the 1930s it was used to describe the proposed union of Germany and Austria. There had been some support for this as early as 1918 – however a combined Austro-German state was considered a danger to its neighbours, so it was explicitly banned in the Treaty of Versailles. By the mid-1930s Austria had its own Nazi group, influenced by its parent movement in Germany. In July 1934 Austrian Nazis launched an unsuccessful coup attempt, murdering the Austrian chancellor. They continued to attract members and advocate unification with Germany, a proposal rejected by the centrist government in Vienna. Under considerable pressure, the Austrian chancellor Schuschnigg convened a March 1938 referendum on Austrian independence. Claiming the election was rigged, Hitler sent Schuschnigg an ultimatum: relinquish power to the Austrian Nazi Party or face invasion by the Wehrmacht. Schuschnigg sought help from Britain and France but this was refused, so he resigned as chancellor. German forces crossed the border the next day, moving into Austria without resistance. Local Nazis were installed in power in Vienna; Anschluss was confirmed (99.7 per cent) by an April 1938 plebiscite, itself almost certainly rigged. Munich agreement. With Hitler menacing Czechoslovakia, British prime minister Neville Chamberlain intervened, meeting the fuhrer three times in September 1938. At the first of these meetings, on September 15th, Chamberlain agreed to Hitler’s demands; Britain subsequently urged Czechoslovakia to concede the Sudetenland to Germany. The two leaders met again a week later and Hitler’s position had hardened: he demanded German forces be granted immediate access to the Sudeten region. On September 29th Hitler, Chamberlain, Benito Mussolini (Italy) and Edouard Daladier (France) met in Munich to resolve the crisis. They signed an agreement approving the Nazi annexation of the Sudetenland, provided Hitler proceed no further into Czechoslovakia. The Czechoslovak leader Benes was told he could submit to the occupation of the Sudetenland or resist the Nazis alone; he chose the former. Chamberlain returned to Britain where he famously – and incorrectly – said the Munich agreement had secured “peace for our time”. German troops rolled into the Sudetenland two days later. In December 1938, elections there returned a 97.3 per cent vote for the Nazi Party. Czechoslovakia. Having lost its western region to the Nazis, in late 1938 Czechoslovakia was further torn apart by international conferences. Significant Czechoslovak territory was surrendered to Germany, Hungary and Poland, further reducing and weakening it as a nation. Hitler, of course, had no intentions of honouring the Munich agreement. In March 1939 he summoned the new Czechoslovak leader, Emil Hacha, to Berlin and told him a Nazi invasion would commence later that day. Threatened with the carpet-bombing of Prague by the Luftwaffe, Hacha ordered the surrender of his armed forces. By the end of the following day, Hitler himself was standing in Prague and proclaiming victory. Independent Czechoslovakia ceased to exist; its eastern half, Slovakia, was given autonomy as a pro-Nazi satellite state. The Munich agreement was exposed as a sham; the policy of appeasement had failed utterly. Hitler’s ruthlessness, dishonesty and contempt for international negotiation had been exposed. The Soviet-German pact. By mid-1939 the Nazis had turned their attention to Poland. In public, Hitler’s main concern was the city of Danzig, once part of East Prussia but now deep in Polish territory. As with the Sudetenland, the majority of Danzig citizens were German-speakers. But Hitler’s true interest in Poland was lebensraum: ‘living space’ and natural resources for Germans. The only obstacle to a Nazi invasion of Poland was how the Soviet Union might respond. This question was resolved in August 1939 with the signing of the Treaty of Non-Aggression between Germany and the Soviet Union. This agreement committed Berlin and Moscow to peaceful relations for a period of five years; it also provided for exchanges of raw materials, machinery and weapons. Hitler and Stalin had previously been bitter rivals, more likely to make war than sign peace treaties, so the pact shocked observers around the world. They would have been more shocked if they knew that at the same negotiating table, the Nazis and Soviets had made secret plans to carve up and lay claim to Poland and eastern Europe. 1. The march to war was driven by Hitler’s obsession with lebensraum: obtaining more territory for the German people. 2. His intentions were made clear in a meeting with military leaders in late 1937, as recorded in the Hossbach memorandum. 3. In 1938, Hitler ordered a series of provocative and expansionist moves into Austria and Czechoslovakia. 4. Britain and France adopted a policy of appeasement, allowing some German expansion in the hope of preventing war. 5. In the 1938 Munich Agreement, Hitler pledged to restrain further expansion if his claims to German sovereignty over the Sudetenland were recognised. J. Llewellyn et al, “The road to war”, Alpha History, accessed [today’s date], https://alphahistory.com/nazigermany/the-road-to-war/.